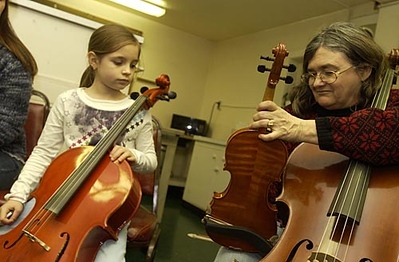 Chris Williams, right, tunes a violin in between songs as Carmin Jamison, 8, looks on during a fiddle jamboree Saturday evening in the kitchen at Gilbert Lodge at Twin Lakes Camp. Williams says the fiddle jamboree, which is open to a variety of string instruments and hand drums, meets before the Bayside Travellers dances held the second Saturday of the month. For more information on joining the fiddle jamboree, call Williams at (231) 421-1278.